This is the perfect weeknight recipe. It’s fast, healthy, simple and delicious. What more to ask for? In a pot, add the peas to boiling water and cook for about 3-4 minutes, drain in a colander. To the same pot add oil and fry the onion until soft, add the peas and mash with a potato masher or the back of a large spoon. When mushy add butter, mint and season with salt and pepper, when butter is incorporated, remove from heat and keep warm. Fry the salmon in oil and/or butter in a pan on high to medium heat, a couple of minutes on both sides until cooked through. But be careful not to fry to long as this will make the fish dry, so rather a little bit less cooked than to much. 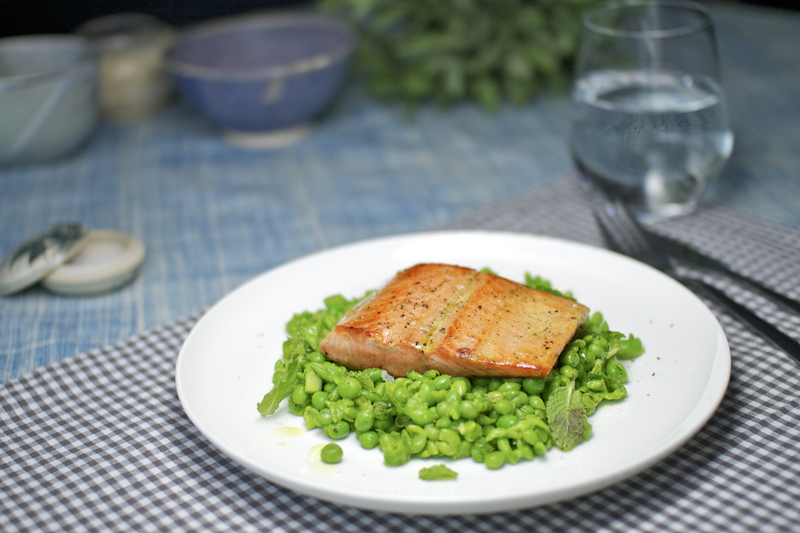 Arrange on plates with the mushy peas and the salmon on top, garnish with some more mint and some freshly ground pepper. Salmon is always best when cooked simply. I always think it’s a travesty when people disguise the flavour of a beautiful fish. This dish sounds perfectly simple.